Freshwater lobsters, aka crayfish, make a tantalizing entrée for a classic summer supper outdoors. From catching to cooking to deciding the side dishes, we serve up the easy how-to. Heading down to the water was my wife’s idea. Our dinner date was almost over. Time to head home, pay the sitter and tuck in the kids. Taking the long way back to the car we saw the moon hanging big and bright out over the bay. We strolled down the boardwalk and into the harbor for a better look. Hand in hand there against the rail under the lights, my wife puckered up for a midnight kiss as I happened to look down into the water and saw them. Crawdads. Mudbugs. Nippers. Crabs. Southerners call them crawfish. Yankees call them crayfish. They look like insects. Taste like lobster. Like some kind of creepy, crawly culinary gold, right there in shallow water under the buggy lights, there were probably 20 king size crayfish clinging to rocks. A dozen more were spider-walking along the bottom, struggling to hold up their massive, meaty claws. They really were magnificent, easily enough to render a bowl of jambalaya or a heaping plate of étouffée. My wife has certain stories she pulls out at parties to illustrate the odd, sometimes painful reality of being married to me. All I can say is this one got heavy rotation that summer as crayfish were suddenly on the menu almost every other week. All the way back to the car I had hand-wringing visions of crayfish tails rendered into a sauce tossed with bacon and chanterelles. Crayfish tails sautéed with wild morels and served over pasta or a medallion of venison tenderloin, my own little version of Up North surf and turf. By the time we got home, I had already put together the plan for a full-blown crayfish boil, done up Cajun style with whole heads of garlic, half cobs of sweet corn, little red potatoes, andouille sausage and Old Bay Seasoning. The backyard picnic table in my mind was crowded with happy friends and frosty mugs of beer, all surrounding a pile heaped high with crayfish. There is one caveat to crayfish for dinner: The only legal crayfish to catch in Northern Michigan waters is known as the rusty. That isn’t as problematic as it sounds, however, because this large, edible invasive monster is so prolific chances are it will be what you catch—not one of our sweet little native crayfish that rusties have endangered. The Michigan Department of Natural Resources actually wants you to eat rusties. Native to rivers and streams in Ohio, Indiana, and Kentucky, rusty crayfish started turning up in Northern waters 50 or so years ago (biologists aren’t sure exactly when) after nonresident anglers brought them here by the bait-bucketful. What fishermen didn’t use they simply tossed overboard at the end of the day. Now, rusties are here for good. Easily distinguished from the native Great Lakes crayfish, which they vastly outnumber, an adult rusty can grow up to four inches long, not including the fearsomely large claws that are capable of pinky-pulverizing power. (Take my word on this.) But their most identifiable characteristics are the two distinct markings found just behind the head—on the sides of their carapace, to be exact—precisely the spot you would hold it when trying to avoid being pinched. The marks resemble splotchy stains, one on each side, as if left there by two celestial fingers dipped in rust-colored ink. Rusties live in dense, shallow-water colonies with anywhere from four to 54 crayfish per square yard. With highly territorial dispositions and a locustlike ability to reproduce (a single female can lay anywhere from 85 to 575 eggs every year) there’s really not a river, stream, or boat harbor in Michigan where a person looking for a little culinary adventure can’t find rusty crayfish hiding under almost every rock. 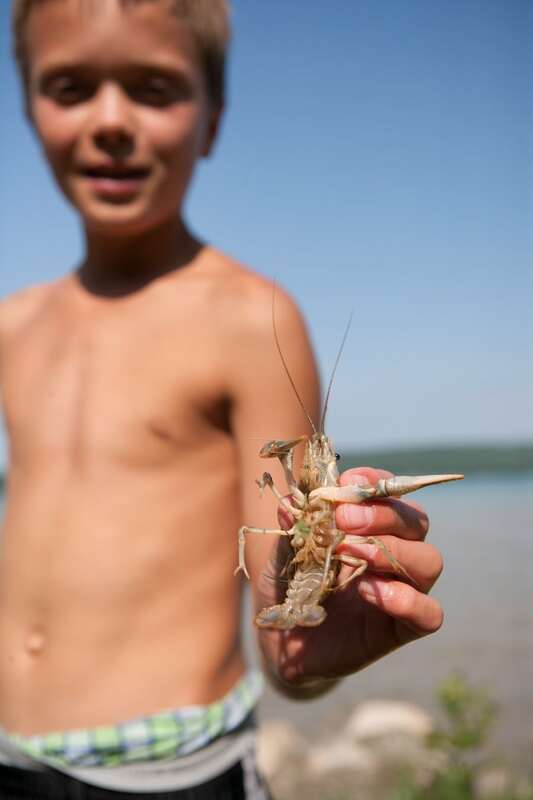 The first thing you’ll need to do is purchase a fishing license, then check the Michigan Fishing Guide for the state’s several restrictions on the use and sale of rusty crayfish. Finding crayfish of the sort that yield more meat than can fit on a thumbnail requires big water and big rocks. Up North, boat harbors protected by rocky breakwalls are the best, because they not only have the underwater boulders that monster crayfish like to hide beneath, but also are typically well-lighted places, which is important since the best crayfishing is done at night. I really haven’t found a better method than hand lining—arguably the most fun you can have with a chicken neck and a string. After dark, big crayfish that would never show themselves in the day come out into the open to feed. Under the lights in my favorite spots, I can actually see the crayfish I’m trying to catch. I just drop the bait, wait for them to take hold and gently pull them to the surface, where I scoop them up one after the other with a long-handled dip net. I don’t consider it a good night of hand-lining unless I pull in about 30 to 40 crayfish an hour, more than enough for my favorite pasta sauce or pot of jambalaya. Oh, and I never skip this critical step—crayfish taste best if flushed out with clean water for a day. I hose mine down first then place them in a cooler with an aerator bubbling and filled with enough water to cover them. When the water looks murky, dump out the old and fill it with fresh. (No aerator? Just change the water frequently.) Repeat until the water is clear, and your crayfish glisten like the culinary gold they are. Plan on around six crayfish per adult. Live crayfish can be refrigerated for up to 24 hours. The best way to store enough for a feast is to rinse them well after they are flushed (see above) then put in a pot with enough water to cover. Add 1/2 cup salt and plenty of fresh dill, preferably with the crowns on, and parboil for about 5 minutes. Cool then freeze until you’ve stashed enough for a party. An hour or so before you want to serve your crayfish, boil in salt and dill for another 5 minutes. Cool the crayfish in the dill brine, then drain. Arrange the prepared crayfish on platters (or directly on butcher paper as we did) and surround with lemon wedges. 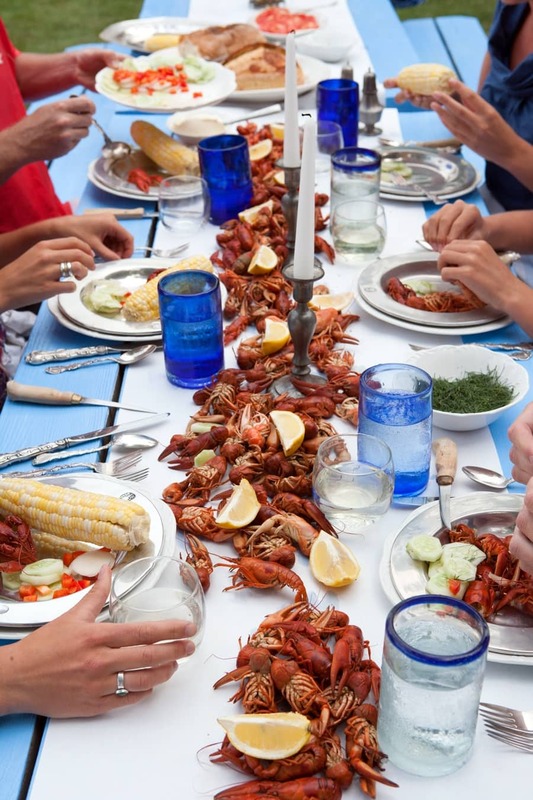 In Nordic countries, a crayfish feast is an outdoor, boisterous mid-summer fete that includes funny hats, bibs, and generous amounts of beer and aquavit, the traditional Scandinavian liquor. We forewent the hats and bibs and opted for local white wine (Peninsula Cellars’ Gewürztraminer works nicely). A paper tablecloth—we used butcher paper—and small knives for digging the meat from the shell are a must. Set out bowls of melted butter, crusty loaves of bread, crème fraîche, and chopped dill. The tiny morsels of meat can be eaten à la lobster—dipped in melted butter and spritzed with lemon wedges—or on open-faced sandwiches built from slices of bread (we lightly toasted ours over a bonfire near the picnic table), a dollop of crème fraîche, and a nugget of crayfish, all sprinkled with fresh dill. 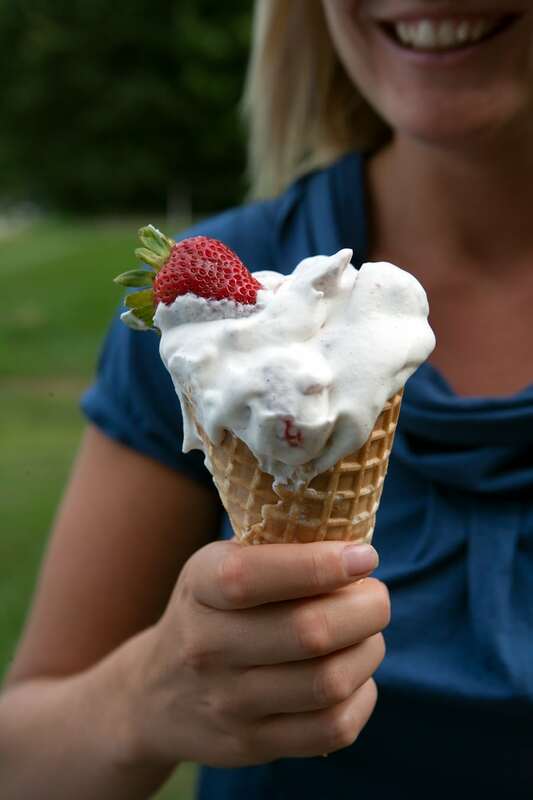 Our dill, cucumber and red pepper salad was a nod to the Nordic, as were the strawberries ’n’ cream waffle cones for dessert. Corn on the cob? That just plain goes with any outdoor feast Up North. This Traverse Classic was published in the June 2009 issue of Traverse, Northern Michigan’s Magazine. Subscribe to the Northern Michigan lifestyle.